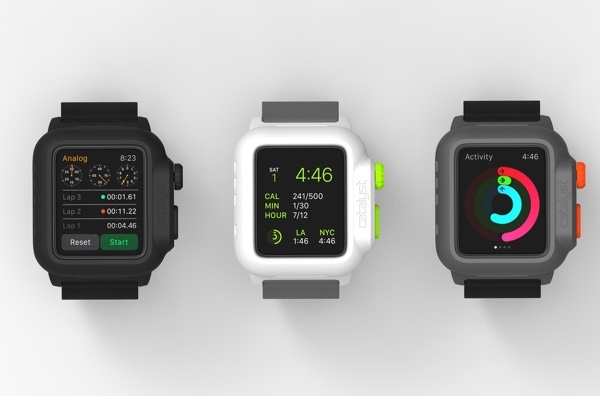 Waterproof iPhone case maker Catalyst has announced its first Apple Watch cases, giving the device additional water and drop protection. Apple’s wearable, the Apple Watch, comes with an IPX7 water resitance rating which means you’re just fine washing your hands while wearing the thing, but you probably shouldn’t go swimming with the thing on. We’ve already seen plenty of videos showing people doing just that with no obvious ill-effects, but Apple is apparently concerned enough to avoid suggesting it as a legitimate use case. That means there’s a space in the market for a company to make something that ups that water resitance rating. And that’s exactly what has happened. 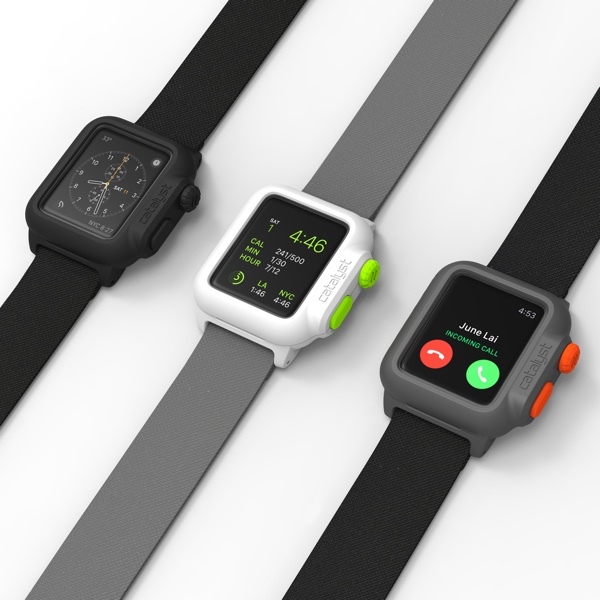 Enter the Catalyst range of Apple Watch cases. Available only for the 42mm Apple Watch, these cases offer IP-68 water protection as well as the snappily named MIL-SPEC 810G drop protection in exchange for sixty of your American dollars. There’s no news on a 38mm version for now, unfortunately. The Catalyst Apple Watch cases come in a range of colors including black and a rather tasty version with multiple colors called Rescue Ranger, and all come with their own NATO-style nylon band. The case itself covers the Apple Watch’s Digital Crown and side button in its quest for protection, though they are accessible via protective covers that add to the colorful nature of the things. There’s more good news in the fact that neither the case nor the NATO bands prevent the Apple Watch’s sensors from working, meaning those who like to get some excerise done while wearing their overly waterproof Apple Watch can do just that. Catalyst’s new Apple Watch cases are still at the pre-order stage and will cost $59.99 when they start shipping some time in November. You can pre-order it from here. I want to say that:i was uｎｌｏｃｋing my familys iphones for free. I was using some unporfessional uｎｌｏｃｋ method was damaged my iphone. the phone got barred after 2 weeks My girlfriend used ATTIPHONEuｎｌｏｃｋING 8 month ago, but his phone is still find without any issues. be carefull with unprofessional uｎｌｏｃｋers and make sure you will use the most professional uｎｌｏｃｋing team. Is there anyone still doesnt know how to սոⅼοсking AT&T phones PERMANENTLY??? I know a really good site! Go try just google atttiphoneeuunlocking, never took us more than 6 hours to ՍΝᏞΟᏟΚing my phone!